Washington, D.C. – NewsMatch opens today with more than $3 million in matching support for nonprofit newsrooms across the U.S, including The New Hampshire Center for Public Interest Journalism, which publishes InDepthNH.org. The campaign doubles donations to 155 nonprofit newsrooms in nearly every state across the country through Dec. 31, 2018. 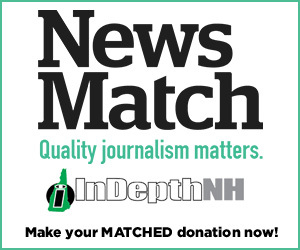 Founded three years ago by veteran journalist Nancy West, the New Hampshire Center for Public Interest Journalism is the only nonprofit newsroom in the state to qualify for NewsMatch. NewsMatch is the largest grassroots fundraising campaign to support nonprofit news organizations. Individuals can learn more, donate and join the movement to support trusted, nonprofit news organizations. Go to newsmatch.org today to donate to the New Hampshire Center for Public Interest Journalism, your trusted, nonprofit news organization. This is the third year of NewsMatch, and the number of nonprofit news organizations participating in the campaign jumped by more than 40 percent since last year. Each organization is eligible to receive a total of $25,000 in matching funds for small-dollar up to $1,000 donations from individuals. NewsMatch is designed to help fuel a surge in giving to local and investigative reporting and strengthen nonprofit newsrooms through training and shared resources.